To quote the favorite phrase of a friend of mine, it’s like jabbing a pointed stick in my eye. Yesterday I got a call from the owner of a local manufacturing company asking my advice on whether to implement SAP. This is a single-site $5 million operation with one nice big contiguous manufacturing floor, making rather uncomplicated widgets that have a raw material lead time of a couple days and a manufacturing cycle time of a couple hours. The next sound he heard was the bam bam bam of my head banging against the wall. Obviously he hadn’t read my post on the False God of the Almighty Algorithm, otherwhise he could have guessed my opinion. Of course SAP is not really designed for companies of that size, and the cheapest implementation I’ve heard of is in the $500k range. But the same can be said for almost all ERP systems. Some form of system may be needed for large multi-site or complex operations, but they are often not appropriate for smaller companies, and the are almost always overly relied upon at larger ones. I talked to this guy at length about what he really needs, the additional complexity that ERP (let alone SAP) inherently creates, etc. He remained unconvinced… he had read that he must have SAP to grow. So I sketched it out for him, which I’ll share here. First you need a team to decide on the requirements and identify an appropriate ERP solution. If they’re good, they will first take a look at your processes to see where they could be improved. Then the software is ordered. Then you’ll need the implementation team to actually install the software, configure it to your processes, and do the training. They will migrate the data, do all the integrity checks, and get it up and running. This usually includes some customization by the vendor, which will make future planned upgrades interesting. At that point you’ll probably realize that it’s too big of a job and too complex, so you’ll hire a consultant. That person will seem like a wizard, and will appear to get everything working fine, probably without transfering any knowledge of how it happened. And finally, after everything is working, you’ll need an ongoing support team to keep the whole bloomin’ thing running, pick up the pieces when it tells you to make a few million extra chocolate bars, and to recommend software “feature enhancements” that will be too expensive to implement. In the end you’ll have something that looks like this. But I’m sure someone will be able to figure it out, right? You can always call the wizard back. The line “pay no attention to the man behind the curtain” comes to mind. Total cost: $500,000 plus some assorted medical benefits and chocolate bars. First get some people together and go through a value stream mapping exercise. Nothing fancy… just figure out what you’re currently doing. Take a few hours to think about it, to identify non-value-added activities, and kill those wasteful activities. Next, run down to Staples. Buy a nice big whiteboard. While you’re there, pick up a some markers and erasers, a webcam, and a copy of QuickBooks (Manufacturing Edition). Grab some pizza for your team to celebrate their accomplishment (and a keg of beer if your HR group hasn’t tied you up in your underwear yet). Back at the plant, mount the whiteboard on the shop floor where it will see the most traffic. Draw the flowchart on it. As a lean company you want to pull jobs from customer orders, so think about how the chart flows. Put little labeled magnet tags on the flowchart to indicate jobs. Remember to include your suppliers so you can trigger raw material orders. Get everyone on the shopfloor together and explain this visual method, and how it is everyone’s responsibility to manage the board. Now take the webcam and aim it at the board and connect it to the company’s network so anyone, such as sales and customer service, can remotely view the board at any time to see the status of any job. Take your copy of QuickBooks, spend a couple hours setting it up, create a couple of user accounts for shipping and receiving people (of course receiving is done right to the point of use on the shop floor…). Cost? A couple grand… maybe. I saw this “system” in operation a couple months ago, and since I wrote about it I’ve heard about three other implementations where the whiteboard is THE scheduling system. I also know of a couple implementations in much larger companies where the whiteboard is used for all shopfloor scheduling, with their ERP system (which can’t be killed as it would put a lot of finance folks on the unemployment line) simply managing materials into and out of the floor, and creating vast amounts of paper and reports in the process. Variations include side-by-side kanban, andon lights that trigger a small LED on the whiteboard, and a second whiteboard with metrics and the like. The key is that it is simple, visible, and especially that it is owned by everyone on the floor. The last company I saw using it had no production leads and the supervisor spent all her time with customers… the shop floor folks managed themselves. With one glance you can see which processes are becoming bottlenecks, and which operations need to have people shifted to them. Flow becomes scarily smooth. Simplistic? Absolutely, and damn proud of it. A new idea? Of course not. Visual systems have been around for a long time. But sometimes we need a reminder to take a step back and think about what we want to accomplish. Many of us, especially engineers like myself, can become so enamoured with technology that we forget to think about whether it’s really the best solution. Let me add a couple hundred bucks and another layer of technology to this process. Install telephones at each production operation. Have all of your suppliers on blanket orders. Have someone at each operation pick up the phone every day and call the supplier of the parts used at that op, and tell them to ship that many more. If your suppliers have fallen into the SAP TRAP, make it their problem to figure out how to convert that phone call into necessary computer fodder. If your suppliers are lean and gifted with common sense, have them install a phone at the op that makes your parts; and have your production folks call their production folks directly and take care of the whole thing. It works – really – I’ve done it. Life really can be that simple. Kevin- I did take your first post to heart and tried it. Change was almost immediate and the ownership by the factory folks is great. The most amazing part was how the quiet people that my supervisors were overlooking were the ones that really got it and blossomed into major contributors. As Bill said life really can be that simple. Bill- I am having loads of fun with the chocolate story. Thanks for finding that. Hey those dudes look like MY SAP consultants. No wonder the damn thing still doesn’t work after three years if they’re working elsewhere! Glad to have given you some ammunition, Mindy. I’ve noticed that it seemed to have a major impact on Kevin’s life too. I think people often overlook the fact that Computers are well just computers. A computer is like the material it is made of, hard and not so flexible. I just read yesterday about all of the accoustical work and computer analysis that several physicists have done to unlock the secrets of the Stradivarius Violins. And apparently they really don’t build them like that anymore and the Computers can’t figure out why! In one of the articles it said a computer still cannot do something simple like scan a small room and see that there is a chair, table, tv and small child and the child is doing something with the dog. It said a computer cannot after doing the scan come up with an assessment (put all of the pieces together if you will). As Warren Buffet says most of the stuff that comes out of computers is garbage, its still the person who matters and makes the decision. A computer is just a tool. And no matter how elegant the software and how well it is developed, it will never (I hope in my lifetime anyway) have the flexibility of ole Billy Bob at the corner gargage. I think any of the GIANT ERP software people are going to be hard pressed to come up with any program that beats attaching the information to the product and feeding it JIT upstream (Taiichi Ohno’s Kan ban system). Although I am pretty sure that the people at SAP will die trying. Long, long, ago, when having 512K on your mainframe was a cause for celebration, it was proven that a good systems analysis implemented without computerizing it made the same amount of improvement as making it digital, if not more. Now that we have unlimited capacity, it’s probably still true. (And if I hear one more time “it’s on the intranet” when I’m looking for something to tell me how a process is performed or what’s on some schedule, I’ll go crazy. If it’s not on the wall in plain sight, it might as well be lost. A very interesting spin on the age old problem of branding to gather with teh responses and comments. It is safe to say that for small companies some of the current ERP systems can be a bank breaker to implement. However, newbies such as SAP Business One, offers the small to midsize companies a very usefull tool with a lot of standard functionalities that some larger system would kill for and with a very comparable small price foot print. Suggesting a solution which on the face of it traps a company in their current growth cycle, I would suggest should be taken with a caution pill. There are other ERP solution options – apart from SAP, or Oracle, or Microsoft – which work and come in at a lower cost, in licencing and implementation. Your manufacturing owner needs to look around some more. Simon- the with such short cycle times and lead times, if you are manufacturing right then there is practically nothing to track. Any software system would be a waste. Let’s not implement software simply for the sake of software. Find the right tool for the job, and in this case it is simple, very simple, visual methods. I could show you a factory 5x that size that uses visual instead of software very effectively. Interesting discussion. 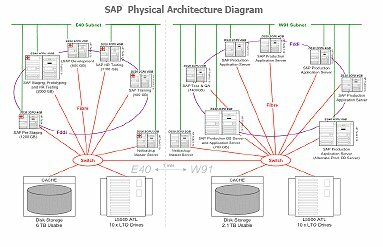 I was involved with the specification stage of an SAP project 10 years ago when I had responsibility for manufacturing. We kept SAP off the shopfloor completely. The most anyone needed was a spreadsheet. The two main problems with any ERP system are that firstly the business model of the entire industry is built on complexity. The more of it they create, the more money they earn. Secondly these systems drive supply chains and factories with forecasts which is the last thing you want to do. The result is that you pay an awful lot of money for something virtually guaranteed not to work. The sad thing is that after fixing these situations for over 20 years, I find the top sales guys are still flogging ERP. No-one seems to be running their supply chains and factories without it. Great post. It reminds me one of the first things I learned about software requirements: find what the user needs, not what he wants and maybe the best option is something simpler. It was doomed from the start, years on it is still not finished and massivley over budget… oh and the bright CIO who had the idea has moved on to pastures new no doubt earning more due to his success! ERP is no bad thing – if used in moderation. Sort out the flow on the shop floor, make it visual and let the ERP do the number crunching it is good at – but keep it to a minimum! First of all, there are ERP providers out there who can sell you better products than QuickBooks for a couple of grand. And second, you have to think about the future: QuickBooks might work for now, but they will need to buy an ERP anyway, sooner or later. Interesting article and discussion. From my experience I agree, that ERP are way too “complicated” and using them on the shopfloor leads to a lot of non value-added activities, and if fact, you can not fully rely on them. The whiteboard example seems to be very simple and powerful, but would you guys mind to give a more detailed info about how it can be used in real life? Can you simply describe the process of using whiteboards for running the production on an example? This would help me (and maybe some others) to better understand. Staples uses a whole lot of SAP for customers to hit their EASY Button.